The California Governor's Council on Physical Fitness and Sports selected Trips for Kids (TFK) as its 2009 Non-Profit Organization of the Year from more than 700 nominees. 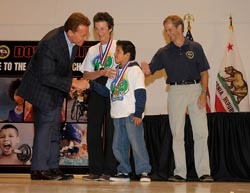 Governor Arnold Schwarzenegger and Anthem Blue Cross Foundation presented the award to TFK with a gold medal on September 16, 2009 at the Fourth Annual Spotlight Awards ceremony in Sacramento, Calif.
As part of the award, Trips for Kids will receive a $10,000 donation at a special ceremony in San Rafael, Calif., on Nov. 19. "Trips for Kids is overjoyed to be the recipient of this prestigious award," said Marilyn Price, founding director of TFK. "Recognition from the Spotlight Awards will significantly boost our visibility and encourage more people to sign up as Trips for Kids chapters. The prize will really help us give underserved youth an opportunity to be active through our mountain bikes rides." The California Governor's Council on Physical Fitness and Sports is a non-profit, non-partisan organization dedicated to promoting physical activity for all Californians with an emphasis on children and youth. Anthem Blue Cross Foundation has granted more than $1.75 million to the Council over the last five years. "I congratulate all of this year's Gold Medal winners," Governor Schwarzenegger said. Council Chairman Jake Steinfeld, founder of Major League Lacrosse and Exercise TV said, "We're proud to shine a spotlight on each of our awardees because they are each doing something amazing to help California's children." Trips for Kids is a 21-year-old national non-profit based in San Rafael, Calif., with programs that give underserved youth a chance to experience the joy and challenge of mountain biking, while learning valuable life skills and an appreciation for the outdoors. There are currently 66 Trips for Kids chapters in the United Stated, Canada and Israel. For more information on Trips for Kids, please visit www.tripsforkids.org or call founding Director Marilyn Price at 415.458.2986. Trips for Kids (www.tripsforkids.org) is a nonprofit 501(c)3 organization based in Marin County, California. With 60-plus chapters operating in the United States, Canada and Israel, Trips for Kids opens the world of cycling to at-risk youth through mountain bike rides and Earn-A-Bike programs. Trips for Kids started in 1988 as a grass roots effort by avid mountain biker, environmentalist and Mountain Bike Hall of Fame inductee Marilyn Price to provide inner-city youth a way to enjoy the outdoors and gain much-needed life skills.